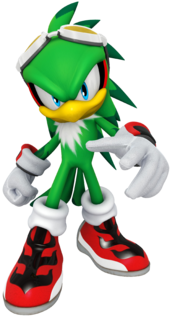 Jet the Hawk is a fourteen-year-old green hawk from the Sonic the Hedgehog series, the leader of a gang of thieves called the Babylon Rogues, with his partners Wave the Swallow and Storm the Albatross. He is also one of Sonic's rivals. His expertise at riding Extreme Gear has the earned him the title of "Legendary Wind Master". He was voiced by Jason Griffith and is currently voiced by Michael Yurchak. Jet's makes his debut in a Mario-related game in Super Smash Bros. Brawl. However, this appearance is not personal, and instead only Jet's inanimate model can be seen as a trophy; likewise, an artwork of him is printed on a sticker. Jet makes another appearance as a trophy in both versions of the Super Smash Bros. for Nintendo 3DS / Wii U in the Super Smash Bros. series. Jet appears as an advanced spirit in Super Smash Bros. Ultimate. Jet the Hawk was originally supposed to appear at least in the Wii version of Mario & Sonic at the Olympic Games, but he does not appear in the final version of the game at all. An unused file of Jet's model remains in the PAL version of the game and can be played through hacking. Jet the Hawk appears as a rival in the Festival Mode of the Wii version of Mario & Sonic at the Olympic Winter Games. He appears as the rival of the Snowboard Cross event. If he happens to win the event, he says that he's the best and does a victory dance. In the Nintendo DS version, he appears in the Adventure Tours as the rival in Cubyrinth and challenges Sonic to the Deluxe Halfpipe event. If the player quits the challenge, Jet will exclaim that the event was "too easy" and will do another victory dance. Jet appears in both versions of Mario & Sonic at the London 2012 Olympic Games as a non-playable character. In the Wii version, he is one of the various characters that players can speak to in the London Party Mode and a rival in the Dream Discus event. If the player defeats him, they will be awarded with a sticker. In the 3DS version's story mode, Shadow challenges Jet to a 3000m Steeplechase match. After defeating Jet, he promises to help Sonic, Tails, Yoshi, and Silver. Once everyone finds the fog machine, Jet tries to destroy it, but Shadow stops him. Jet appears in Mario & Sonic at the Sochi 2014 Olympic Winter Games as a rival once again in the mode Legends Showdown. He is found in Area 3, and is raced against in Snowboard Parallel Giant Slalom. Jet reappears in Mario & Sonic at the Rio 2016 Olympic Games as a playable character for the first time in the series. He is only playable in the Football and Duel Football events. 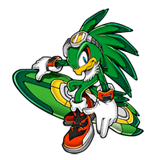 Jet A hawk who is the leader of the Babylon Rogues and also goes by the moniker "The Legendary Wind Rider." When it comes to Extreme Gear racing, there is no one better. Jet's extremely competitive and takes tremendous pride in winning, so you know things are going to be exciting when he takes on the speedy Sonic in an Extreme Gear battle. Wii Sonic Riders: Zero Gravity (01/2008) NA: Jet the Hawk, a.k.a. the Legendary Wind Master, has a lot of cool stuff going for him besides his name. He's amazing on his Extreme Gear, a flying skateboard. Unfortunately, he's no hero–he leads thieves called the Babylon Rogues, and he can't stand losing to Sonic in anything. PAL: Being known as the Legendary Wing Master is pretty cool on its own, but to earn that title by being the greatest at riding flying skateboards called Extreme Gear? That's awesome! He's the cocky leader of the Babylon Rogues, a group of thieves, and he can't stand losing to Sonic. This page was last edited on March 10, 2019, at 10:54.